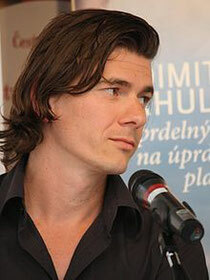 Dimitri Verhulst comes from a broken home and spent his childhood in foster homes and institutes. He made his debut in 1999. His breakthrough to the general public was in 2003, with ‘Problemski Hotel’, about residents of an asylum-seekers’ centre in Arendonk (Belgium). In 2006 his novel ‘De helaasheid der dingen’ (translated as The Misfortunates) was published. His next novel was entitled : ‘Mevrouw Verona daalt de heuvel af’ (translated as Madame Verona Comes Down the Hill). In 2008 ‘Godverdomse dagen op een godverdomse bol’ (E: Goddamn Days on a Goddamn Globe) was published : this resulted in the Libris Prize in 2009.